I have a post I really want to write, about growing into who I am instead of who I think I should be. But I have a migraine. Or at least I think it is a migraine- my headache is pretty mild, but it is accompanied with nausea. Whatever it is, it is making it impossible to think through what I wanted to say. So I'm going to talk about socks and bags and style blogs instead. It seems more what I'm up for tonight. When Mr. Snarky first came to America, he complained a lot about socks. Specifically, he complained about how he could not find any socks as good as the socks he bought in New Zealand. I rolled my eyes and told him I was sure our American socks were fine and he just needed to look around to find the brand that suited him. I am now ready to admit that I owe him an apology. I first started to suspect he might be right back in 2004, when we took a trip to Vancouver to get Mr. Snarky's visa renewed. It was colder than I expected, so I went to a Roots store near our hotel and bought a fleece and some socks. Those socks were AWESOME. I wore them for at least five years and mourned them when they finally wore out. I tried all sorts of stores to find American socks as good as those Roots socks. I failed. Eventually, I gave up and just resigned myself to socks that lasted a few months at best before either stretching out and bunching up in my shoes or having a hole sprout in the toe. I considered it a win to have found a brand of socks that at least stayed in place for a month or two. Then we went to New Zealand in 2013. Once again, it was cold, and once again, we went to a local store to get some supplies. This time it was Farmers, which is like a New Zealand version of JC Penny (sort of). I bought a three pack of lightweight wool socks and they are AWESOME. They are soft and warm and they stay in place and not a single one of them has sprouted a hole in the toe. They are my favorite socks and I wish I'd bought more of them. Once again, I find myself shopping around looking for socks that approach this level of awesomeness. NO JOY. Mostly, they sprout holes in the toe. One pair I bought seemed soft and warm and comfy... but had a hole in the toe after just three wearings. Other pairs bunch up. I am seriously considering asking my in laws to send me more socks, but it is sort of embarrassing to admit that I can't find any good socks in my own country. Back in 2003, I started a job that required some travel. I splurged and bought a really nice laptop bag. It converted from backpack to shoulder bag, had well-designed pockets, and was wonderful. I carried it for over ten years and loved it. Unfortunately, one of the pockets finally ripped out and I decided it was time to replace my beloved bag. I thought I'd just replace it with an update of the one I had, but the company that made it had gone out of business in one of the intervening recessions. I'd been casting about for a suitable replacement for a few months when I came across a review of Lo and Sons bags (more on where I saw that review in a minute). 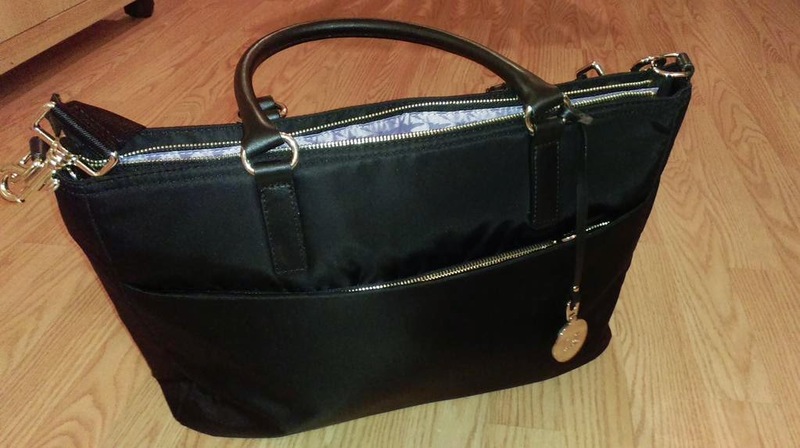 I put "a new computer bag" on my Christmas wish list, along with a link to the bag I liked. Mr. Snarky took the "hint" and got me the new bag I wanted. I've been carrying it for a couple of weeks now, and it is pretty wonderful. The pockets are thoughtfully designed, the bag is comfortable to carry even with my not-so-slim client laptop in it, and it looks great. I found the out about the Lo and Sons bag via a giveaway on a site called Corprette. I found that site because I was on a mission to find some sources of style inspiration. I realized that all of my ideas about style were formed when I was younger and thinner, and perhaps it was time for an update. Corprette is in general a little too formal for me, but I do get some ideas from it. I've also found a site called Not Dressed as Lamb that looks really nice but so far hasn't really led to any style inspiration for me. I could use some more sites, I think. Anyone who knows of style bloggers that would make sense for a 40-something who generally dresses in something like business casual for work and is a size 12-14... tell me in the comments! I've also started pinning clothes ideas, but I haven't really figured out how to use Pinterest to find other ideas (beyond what their algorithm recommends for me), so I'd be happy for advice on that, too. And if you know of a brand of awesome socks that I can buy here in the US, I'll be forever in your debt. Long time lurker here - thanks for all thoughtful and thought-generating posts. Some blog suggestions : Wardrobe Oxygen, Does My Bum Look 40 in this, Franish , Looks Good From the Back, UNFancy, Wearing It Today and Penny Pincher Fashion. I can't comment on American socks, but I will agree that NZ socks are actually pretty good. I really like the Icebreaker range for wool & my cotton socks are from Max. I also like the Lululemon no-show running socks - I don't wear them for running but they're great low cut socks with my merrell & Adidas casual sneakers. I actually find Farmer's kids clothes really good value - I LOVE the merino. It washes & wears so well. Hmm. Actually now I think about, maybe NZ does good warm clothes & socks because they don't really understand home heating? I don't have any specific sock brand recommendations, but I know that most of my favorite socks that have held up for a long time are from sporting/hiking stores. Places like REI, or other sporting goods stores. Get socks intended for hiking - they tend to be sturdy, warm and wicking. Not necessarily fashion forward for business situations though! I'll double check my sock drawer when I'm really awake but I do want to recommend Angie of You Look Fab. She has great style IMO, and could be a match for you. She makes it look easy but also tends to create uniforms for herself that look really polished without much work too. Along the likes of the suggestion above, I'm a big fan of my Ecosox hiking socks. Super soft and durable. I used to really like YouLookFab also, but I wandered away when style became less important than TTC. Regarding socks, I've mostly enjoyed SmartWool socks, which I've found at REI and a locally-owned shoe store in Austin (Karavel). I also ask for SmartWool socks for Christmas every year. I tend to poke holes in the toes of socks and running shoes, but I've rarelyhad a toe hole in a SmartWool sock. I do have a couple of athletic pairs that are developing thin spots in the heel and ball of the foot, but I honestly can't remember how old they are, and they may be from my long-distance running days, about 5-7 years ago. Costco has the socks for you. I couldn't find them on their website, but they have a 3-pack of wool-blend socks (about $15) that are the BEST. I am wearing them now. I wear them every day during the winter. Not terribly thick, have the "arch support" stitching that translates into "doesn't bunch up around your arch". Last time we were at Costco, I bought all the colors they had. I have no advice about socks, but wanted to say that I hope your head is feeling better! Liking the sock recommendations! We all have sock issues around, so I'm in the market for men's/women's/kids' socks because I'm also tired of throwing away hole-y socks every time I do the wash.
For professional style blogs, I used to read Franish, Wardrobe Oxygen, Looks Good from the Back. I quit all style blogs because it led to too much WANT WANT NEED BUY with clothing/accessories. I have no problem with the higher end sports socks I buy. They last for a few years with moderate use. For really nice socks, I agree with shopping at an outdoors store like REI. They are hit or miss in terms of comfort/stretchiness, but there are some good finds. I have this one pair of Smartwool socks that I LOVE and a few others that I don't love as much (too tight/itchy). I buy gold toe and smart wool (casual and sport, respectively) socks and they are fine. Cheaper socks are just cheaper. You may be interested in Imogen's style website. people who pay her. But, she knows her stuff. and color/value contrasts. All just good design advice. Not a style blog per say, but I've heard really good things about Stitch Fix from multiple not-related sources. My socks always tend to wear out in the heel - I got three pairs of smartwool socks for Christmas last year and all but one already have holes :/. But, my favorite pair of socks are Darn Tough socks (http://darntough.com/) - also pricey but so far they are the most durable of any I've worn! Bridgette Raes, she's a style coach, and I find her style very thorough. MaiTai's Picture Book, she always looks very put together and elegant, but not overly corporate. She wears lots of Hermes scarves (! ), but I still find her outfits inspiring. Lady of Style, she post both her work and non-work outfits. Although she is very fashion conscious, she does not look "trendy". Regarding Pinterest, have you tried searching something like "business casual attire"? You could then pin what you like, and then check out the boards of the person who pin the picture (if you pin more of their pins, you could start following) and/ or check out the source of the pin (you can find more blogs to follow). Socks - Try Carhartt socks. They now have a women's line that has a great range of reasonably priced socks that fit great, stay where they are supposed to, and have been holding up great for me. A limited selection is available at Amazon which is great for trying things out a pair at a time with no shipping costs. My Thorlos have lasted forever. Some of them are starting to get thin, but it has been years, and I wear them all the time. And the blue hiking socks work under jeans and don't look too "I just came from the gym." At least, they do for me. I read several of the style blogs listed here and liked them, but I've had to cut way back on my blog reading, and style blogs were the first to go. alreadypretty.com may be of interest to you, maybe not. Old Smartwools lasted forever, then they changed them and I got holes in the ball of the foot consistently (but it took a year), and then I think they changed them again and I think they are again more durable. For running socks, balega is awesome. I usually get mine from Amazon. I have two pairs and alternate & they are cushy and have lasted for years. Keen Bellingham Crew Lite Socks. Wonderful wool socks. I've got toenails that go through most socks in three wears, max. I've never worn out these either on toe or heel (unlike my smartwool socks and even some other keen ones). I'll wear them 3 days in a row with no apparent ill effects. The right and left socks seems unimportant and playfully cute at first, but I can attest that I can hike longer and happier in these socks than any others, and I think it's due to the slight bit of arch support that differentiation gives you.